In addition, the all-purpose lifts allow end users to handle jobs that include multiple applications from start to finish in industries as diverse as construction, drywall, electrical, HVAC, industrial manufacturing, painting and plumbing. HB-1430 lifts are heavy-duty, safe and lightweight, with low wheel loads that allow users to maneuver them over delicate floors and get onto green concrete sooner. They also provide an exceptional working area, with platforms that are 25 inches wide by 60 inches long and 30-inch slide out extensions for increased platform length. The lifts can accommodate two people at a time and hold up to 670 pounds, so users can place tools and materials like drywall and ductwork on the platform and reduce the number of trips up and down on a project. The extensions have a maximum capacity of 250 pounds. The Hy-Brid HB-1430’s platform is operated up and down by the unit’s hydraulics, while the electrical drive and steering system is powered by two 12-volt, deep-cycle batteries. Since the system is electrical rather than hydraulic, it draws fewer amps and requires less overall power. Electric drive and steering is standard for the HB-1430, but is not available in other manufacturers’ lifts. This, combined with lightweight construction, allows the units’ battery power to last up to two times longer, or as long as 10-16 hours. 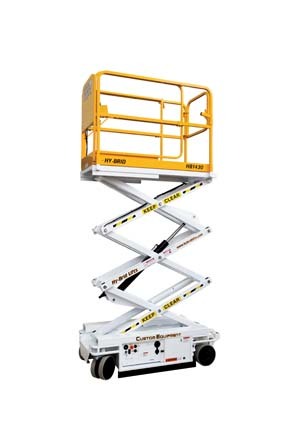 Finally, Custom Equipment designed the lifts for easy maintenance. They feature an on board battery charger that self monitors the current and stops it once the battery is fully charged. This provides a distinct advantage over non-monitoring systems that continue to feed the current into the battery after it is fully charged. This can shorten the life of the battery and cause it to burn out. Custom Equipment also offers optional absorbent glass mat (AGM) batteries that make the HB-1430 virtually maintenance free because they never require users to add water.